The latest in the line of products by Happy Plugs is a gadget that can aslo double up as jewellery- the exquisite solid 18 carat gold earphones. Happy Plugs, a Sweden-based company, is a well-known brand in the manufacture and creation of stylish accessories for smartphones ina wide range of colours. It offers style that suits your personality along with superior quality products that are sold at more that four thousand dealers in 56 countries across the globe. The Happy Plus headphones are especially hand crafted through a skilled goldsmith in Stockholm. These precious earphones are now on the shelves and can be purchased for a whopping $14,500. Perhaps the astronomical price of these headphones is perhaps proportional to the surge or drop in the rate of the precious yellow metal out of which it is crafted! 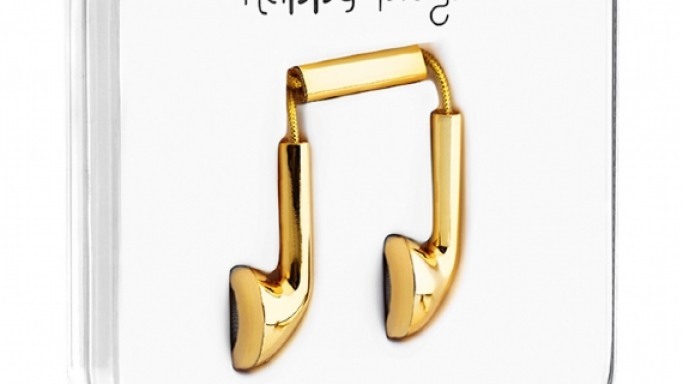 Approximately 25 grams of gold is used to make each earbud of the Happy Plugs headphones- giving this technical gadget the price tag of a piece of gold jewellery. These headphones would attract the extremely rich or gadget-aficionados, however, Happy Plugs has also introduced a cost-effective version for the common buyer with the metallic hued headphones in both silver and gold. These new metallic versions would be available in two variations – In-Ear and Earbuds- and would cost $39.99 and $29.99 respectively. The order for these can be placed online with a delivery time of 3-4 weeks. Nevertheless, the original gold headphones, despite their costly price tag, are bound to get a huge response in terms of orders, according to the CEO and found of Happy Plugs, Andreas Vural. It is too early to say how well the product would be accepted into the market, however, one thing is for sure- it would definitely be on the lists of the fashionistas who would love to flaunt a new ‘technical ornament’ of sorts!